Although this work spans more than fifty years and three distinct historical periods, six of the eight main chapters deal with the twenty-two years of French (and then Napoleonic) occupation of the Rhineland between 1792 and 1814 (one chapter covers the period before 1792, while another chapter plus an epilogue entitled 'Reflections' covers the period after 1815). Despite invasion and years of occupation, the Rhineland was not integrated into France until 1798 when four new departments were formed. Before that, the experience of French occupation was largely that of a pillaging, marauding army that may have adopted the political rhetoric of 'liberation' but whose practices alienated the vast majority of the population. Even then these departments did not become fully integrated into the French empire until the beginning of 1801. It is now a commonplace that Napoleon relied upon local elites in order to impose an administrative system on conquered territories. What is new in Rowe's work is the contention that Napoleon allowed, and indeed reinvigorated traditional ancien régime practices in order to better establish himself (9). This was the key to the success of Napoleonic institutions in regions like the Rhineland, a cultural and politically diverse 'frontier region'. 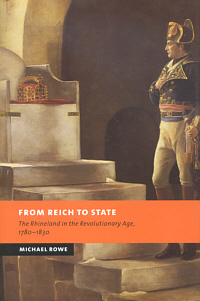 Rowe's thesis reflects an increasing body of literature that paints the Holy Roman Empire not as a sclerotic, backward institution in its death throws, but rather as something that was both economically viable (at least in the Rhineland) with institutions - law courts, commissions, representative estates - that adapted and adopted, up to a point, new political ideas. It also confirms the assertion made by historians like Michael Broers and Geoffrey Ellis that Napoleon's attitude towards conquered territories was much more pragmatic than his revolutionary and especially Jacobin predecessors. Rowe in fact argues that while there was still a policy of imposing French institutions and even the French language on Rhinelanders, Napoleon took local conditions much more into account, to the point where towards the end of the Empire, Napoleon's rule had become more 'imperial' and 'European' than 'French' (156). One of the most interesting aspects of this book is its analysis of collaboration (although Rowe dismisses the term). For the elites, at least those who did not flee the French occupation, it was better for them to remain in their posts - indeed, in the early years of occupation, the Palatinate government, for example, threatened officials who left their posts - than to see the administration taken over by radical sans culottes. However, during the revolutionary era at least, a distinction was made between those who stayed because committed for ideological reasons to the Revolution, and those who remained in their posts in order to diminish the impact of the occupation (70-73). This was not the case though in the Prussian provinces. There, many preferred to emigrate while those that did remain resisted French demands. Those who collaborated were threatened with high treason. This attitude, encouraged by Berlin, promoted popular opposition to the French occupation so that not only was there passive resistance in the form of French decrees being torn down from public places, but collaborators were also harassed. After Brumaire, and the introduction of the prefectoral system (91-94), it took time before local notables rallied to the new regime, something however they were doing by the end of the Consulate. This 'ralliement' was, according to Rowe, something that was a 'compromise between two parties rather than the imposition of somebody's will on another' (98). They rallied for a whole variety of reasons ranging from 'full ideological commitment to pragmatic considerations'. This is no doubt why Rowe rejects the idea of categorising Rhinelanders as either 'collaborators' or 'resistors' (98-99), because they could often be both at the same time. This rather novel idea that one could be both 'collaborator' and 'resistor' is nevertheless problematic. Rowe in effect is arguing that because local notables often served the French authorities on their own terms, subverting or at the very least deflecting official rules, then the line between collaborator and resister became blurred. Rowe moreover argues that Rhinelanders 'colonized' certain French institutions (115). Mayors, for example, often defended local interests against the directives handed down to them from the prefect. It would thus appear that Paris had little or no control over what was going on at the local level (99-103), and had to put up with recalcitrant mayors. Conscription (165-183) is cited as an example of how local officials could exploit the system to their own advantage, a practice fairly common throughout the Empire, but is also used by Rowe as an indication of just how shallow the penetration of the Napoleonic state could sometimes be. Although the Rhineland was occupied as early as 1794, the French did not introduce conscription until 1802. Before then, they attempted to attract recruits to a Rhenish Legion (163-165). The experiment proved a disaster - a mere 2,000 men out of a projected 30,000, most of whom, when they did not desert, seem to have been involved in either smuggling or brigandage. Napoleon had the Legion disbanded and some of its officers exiled to Guyana or Java. The last section of the book deals with the end of French rule in the Rhineland, classified as vacant enemy territory, and the transition to Prussian rule. It deals largely with the tensions that consequently came about between the provincial elite and their attempts to defend the French legacy on the one hand, and conservative politicians in Berlin on the other. In Cologne, for example, with just over 4,000 houses, the city was expected to billet 4,000 Prussian troops (246). There was also a good deal of resistance among Rhinelanders to the idea of becoming Prussian, or to having the Napoleonic codes replaced by the Prussian Allgemeines Landrecht. Despite a good deal of opposition, French law survived in the Rhineland, at least until 1819 when a conservative reaction in Berlin saw the Rhenish laws, adapted from Napoleon's Civil Code, slowly whittled away (267). Catholicism similarly became an important institution around which Rhinelanders focussed as an alternative to Prussia and its Protestant laws. This is an impressive piece of research based on French and German archival and contemporary printed sources, as well as the significant secondary literature that has developed over the years. It is clearly written, and contains thoughtful insights into local conditions that throw light on the larger picture that was the Empire, as well as the complexity of a frontier region that incorporated different histories, traditions and religious confessions. Rowe delves into a number of complex issues ranging from the problem of language and the degree to which the French regime required linguistic uniformity in the construction of a modern state apparatus (116-123); Napoleon's education system and its failure to substantially attract Rhenish notables (132-137); the relations between various religions and the state (142-50); Napoleon's cult of personality and the cult of Charlemagne (151-156); the impact of the Continental System (197-209); as well as the difficulties associated with the merging of two economies and some of the resulting industrial tensions (272-281). The conclusions one can draw from Rowe's research are far reaching. First, the book conveys a more balanced overview of the period and the impact of radical revolutionaries and Napoleonic institutions on the region than has been provided to date. Second, as with other regional studies of Napoleonic Europe, we can see that the Napoleonic regime was above all pragmatic, dependent on local elites in order to function well, and adaptable. It was, in short, capable of modifying its approach and adapting to local conditions. Finally, despite some initial reservations and the collapse of some Napoleonic institutions in the final stages of the Empire, Napoleonic institutions received a good deal of popular support from Rhinelanders. The judicial system in particular largely contributed to the notion of a Rechtsstaat that was one of the more lasting contributions to the region. This may be because, along with Belgium, the Rhineland was one of the regions occupied the longest by the French. It offers a glimpse, despite the complexities of the interaction between France and the peoples over whom it ruled, into just how successful French imperialism may have been if it were not for the unstable character at its head. This is essential reading for anyone interested in the revolutionary and Napoleonic era.